“Daniel is Mexican American, and in the plot line there are some parts where he and his father travel to Mexico and to the past and see how people struggled to give the future generation what they have today,” says Sebastien De La Cruz. 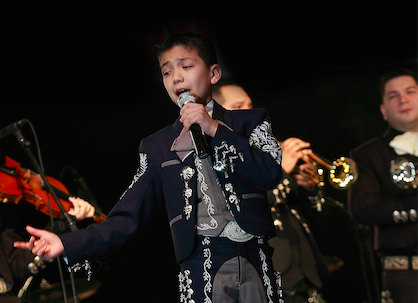 The young mariachi singer, also known as “El Charro de Oro,” will be making his Lyric Opera debut in the world premiere performances of a new commissioned mariachi opera, El Pasado Nunca Se Termina. Gozamos caught up with the young artist by phone from his San Antonio home. In an unusually mature manner for a now thirteen-year-old, he answers questions thoughtfully and politely peppers his answers to me with many a “ma’am”, explaining how his love of the mariachi traje and its jewel-like attire led him to desire being a mariachi at the age of four, and how happy he is that in El Pasado Nunca Se Termina he actually gets to play the role of a mariachi singer. The music of the mariachi opera was created by José “Pepe” Martinez of the world-renowned Mariachi Vargas de Tecalitlan, now in existence for 118 years. The libretto, written by Leonardo Foglia, moves between the story of a forbidden romance set in Morelos, Mexico in times just prior to the Mexican Revolution and present-day Chicago to tell the tale of how Mexico’s cultural conflicts and nationalist struggles shaped one family across generations. The 1910 romance is centered on the character of Amorita, played by Abigail Santos Villalobos, a Puerto Rican soprano now based in Atlanta. Santos Villalobos has been awarded multiple honors including 2013 promising artist of the Santa Fe Opera apprentice program Anna Case MacKay Award and the 2012 Kentucky Bach Choir Competition. Speaking on the phone from Atlanta, Santos Villalobos comments that although it may seem surprising, she found more points of common ground between the two musical forms than one would think possible. For one, she describes the immense vocal prowess which is central to the musical storytelling of both forms. Santos Villalobos also notes the similarity of mariachi singing to Bel Canto, a lyrical style of operatic singing which uses a full, rich tone and smooth phrasing. But above all, she says, both mariachi and opera are both hugely dramatic musical storytelling forms. Preview Performances featuring Mariachi Aztlán will take place at Benito Juárez Community Academy Friday, March 13, 2015, 7:30pm, Saturday, March 14, 2015, 2pm, Saturday, March 14, 2015, 7:30pm and Sunday, March 15, 2015, 2pm and at Genesee Theatre Sunday, March 22, 2015, 2pm. The World-Premiere Performances featuring Mariachi Vargas de Tecalitlán will take place at the Civic Opera House, Saturday, March 28, 2015, 7:30pm and Sunday, March 29, 2015, 2pm. All performances will feature the mariachi performing on stage. El Pasado is performed in Spanish and English, with projected titles in both languages. Check Catalina’s show Beat Latino (on Facebook, Itunes and online, airs Friday and Sunday on Vocalo) .